We are now about five months into our transition to Scrum. Embarking on the experience as a Product Owner has been awesome. 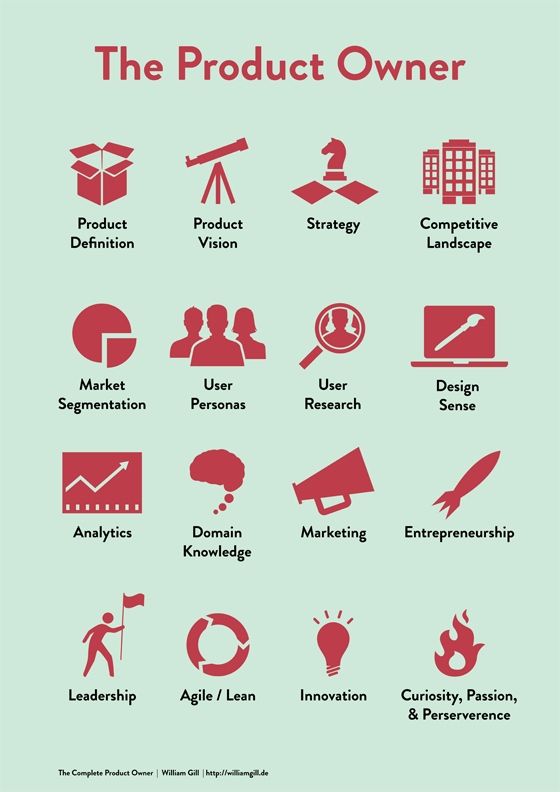 I recently came across a useful graphic that outlines the skills (and there are many) that make a good product owner. This is a good summary. I would add Authority to the chart (but that messes up the layout of the poster, so I’m sure the creator had to make some hard decisions). Authority is a more nuanced form of leadership, in my opinion, but it is important to call it out on its own. Authority comes from your domain expertise, and the way you carry yourself with the dev team and the rest of the organization. You earn this, you don’t just ‘have it.’ It’s a hard thing to master, but it is instrumental to your success as a PO.